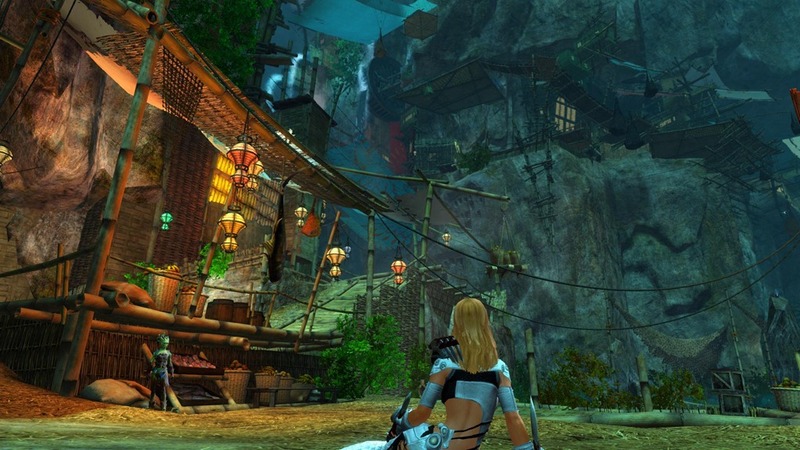 An overview of the GW2 Bazaar of the Four Winds patch coming up on July 9. 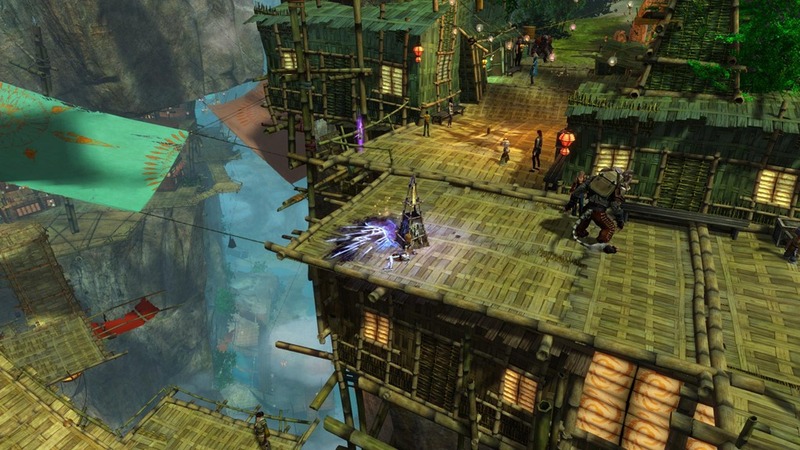 Bazaar of the Four Winds is a massive patch that will bring together works from the Living World team, the sPvP team, and the achievement UI team. There is potentially something for everyone here with armor skins, weapon skins, minigames, new sPvP map, new crafting recipes & resources, and a difficult scavenger hunt. If you love new weapon and armor skins, you are going to love the new account achievement reward system. 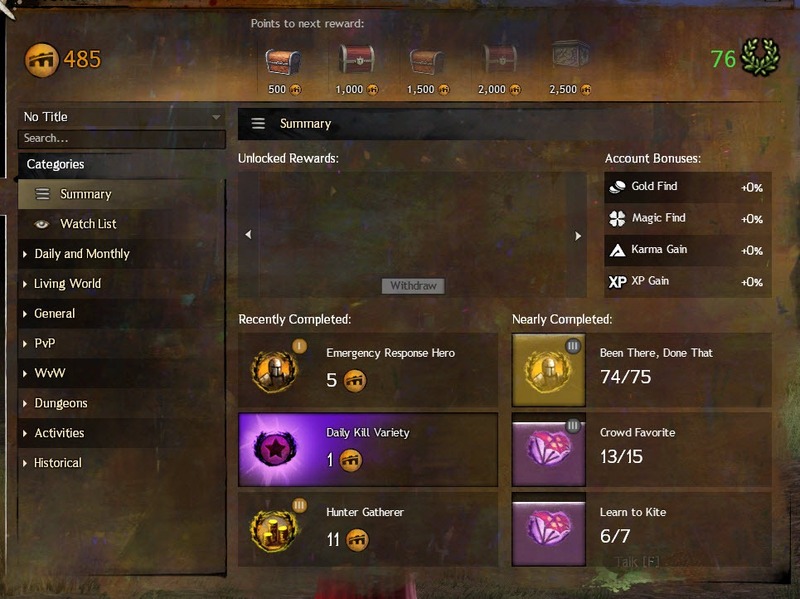 For every 500 achievement points you accumulate, you hit a milestone and earn an achievement chest that grant you account wide bonuses to magic find, gold find, XP gain, and/or karma gain in addition to gold and laurels (2500 achievement points give you 5 gold and 5 laurels for example). 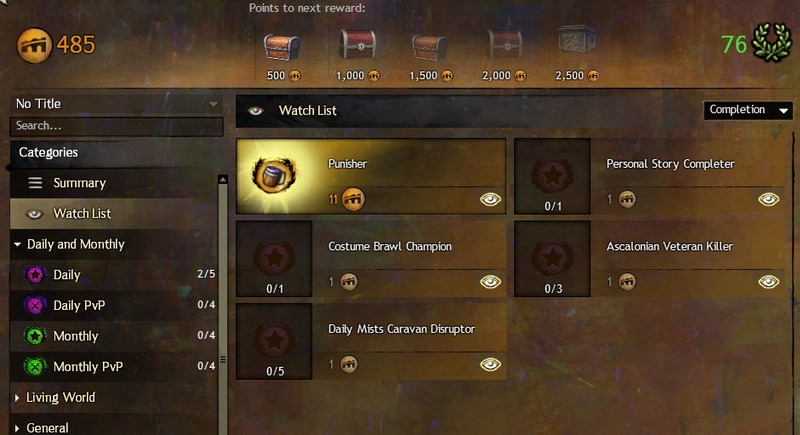 Achievement points are not consumed when you receive these achievement chests and rewards are given for retroactive achievements points (but you get retroactive rewards 1 chest/day). 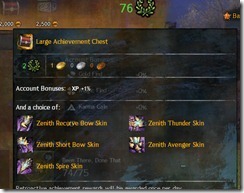 For every achievement milestone you hit that ends in three 0s, you can expect more rewards such as Zenith weapon skins (full set) and 3-piece armor skins (armor skins require higher achievement milestones). You are given a choice to pick between a number of skins and once that skin is unlocked, you can withdraw and use that skin as many times as you like (like HOM skins). Here are just some pictures of the weapon and armor skins you can expect in this patch. For more images, check out the two galleries above. 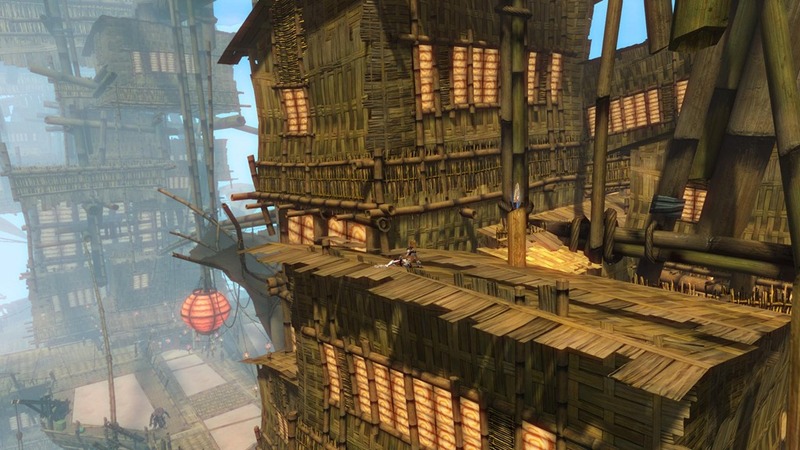 Half of this zone is composed of bamboo houses and wooden platforms that serve as the home to many merchants. The other half, however, is a massive airship called the Zephyr Sanctum inhabited by group of peaceful people known as the Zephyrites. Getting from one point in the zone to the other often require the use of special abilities that are only useable inside this zone. They allow you to dash at speed of light, jump higher, or perform an acrobatic roll in mid-air to pull yourself over long distances. 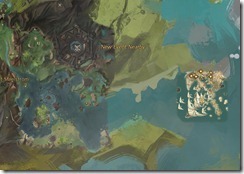 To encourage exploration, there is a massive scavenger hunt tied in with an achievement that require you to find at least 40 of the 52 Sky Crystals scattered across the zone in places that are hard to reach. The verticality design of this zone make maps useless and further increases the difficulty of this scavenger hunt (luckily I do have a full guide up that you can follow step by step above). 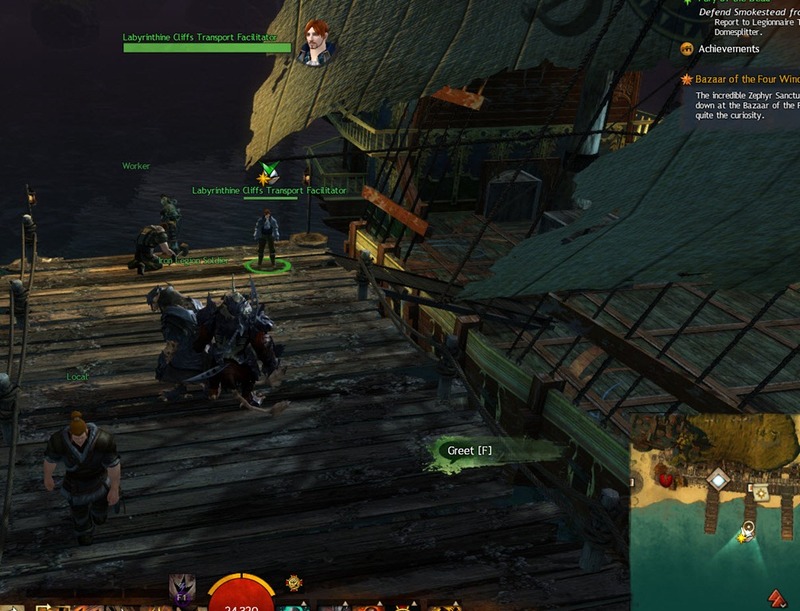 Players hunting down the Dive Master achievement will notice a new dive location high up in the wooden beams of Zephyr Sanctum. 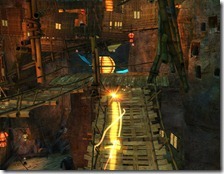 Getting there require some well placed jumps and careful traverse of narrow beams. 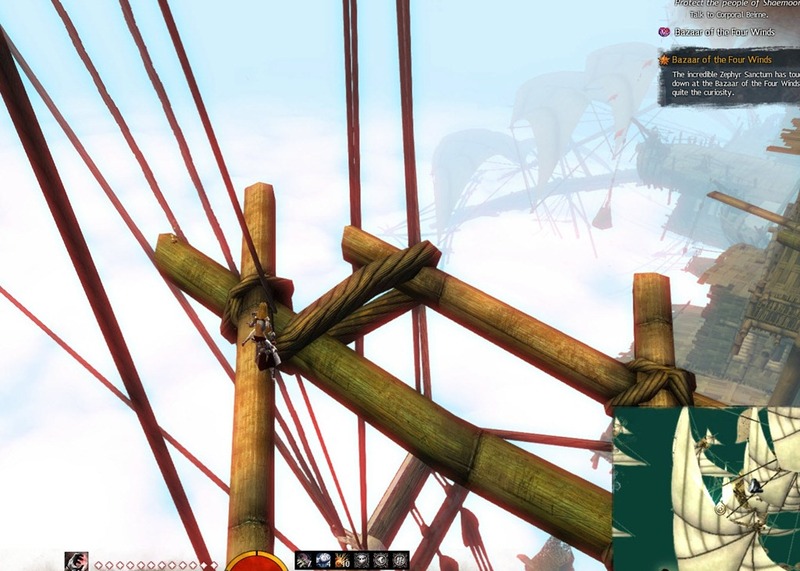 This is the highest dive location in the game and players can expect to fall quite a distance. If jumping around isn’t your thing, you can also enjoy an hourly firework show put on by an odd Quaggan named Kookoochoo. Sanctum Sprint is a new temporary minigame inside Zephyr Sanctum. It is a racing game similar to original Guild Wars’s Rollerbeetle Racing or Nintendo’s Mario Cart. 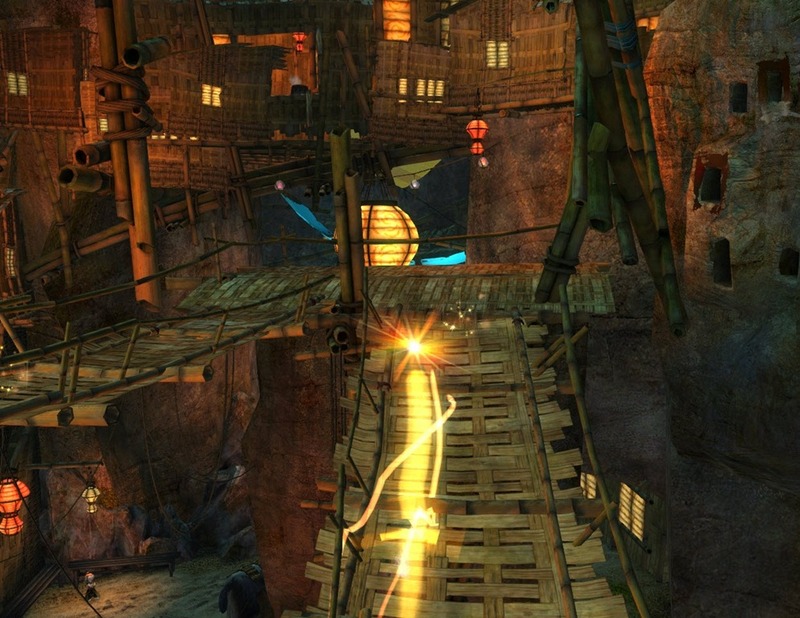 Players will use their special abilities to race against other players in a fairly long track filled with powerups that give you abilities to use against other players. A video will demonstrate this better than words. If you like to read more into it, there is also a detailed guide linked above. Players that place top in the race will earn special achievements and even a title for placing first. Racing in the hot summer heat isn’t everyone’s cup of tea. 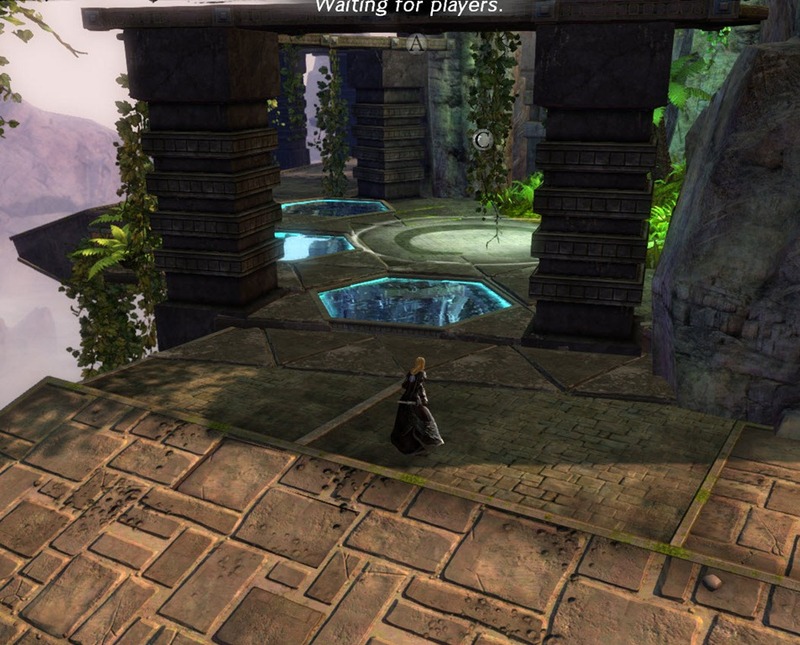 Luckily, there is a new permanent minigame for those who like to sit down and drink. 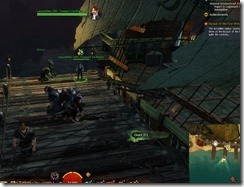 Belcher’s Bluff is a new drinking minigame similar to one of the Order of Whisper’s missions. You challenge other players to a drinking game where each sip damage your health but you can use other skills to bluff or damage your opponents. While you can sit down and play the game right away, it might be helpful to earn some powerful Signature Moves. These special moves are taught by five Masters of Om found in the home instance of each of the five racial cities. Defeat them in a match and you earn their moves. 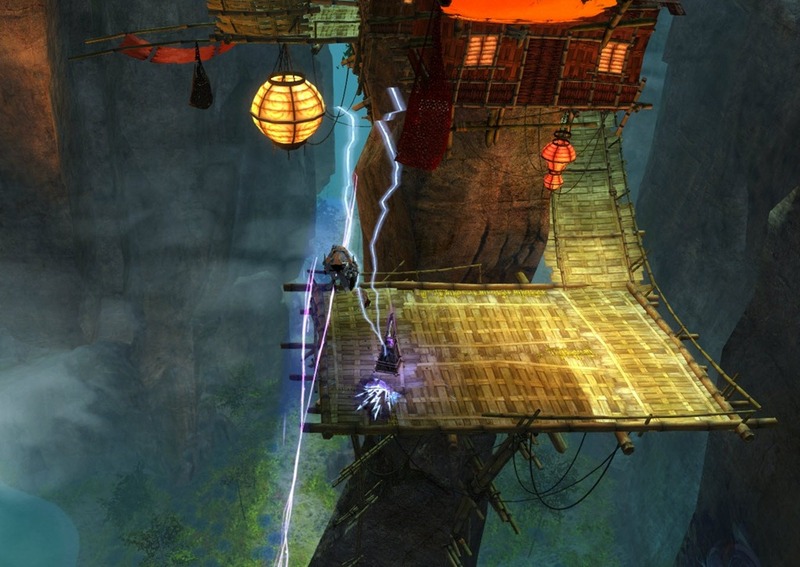 Defeat all five and you can head up against Poyaqui, the Grandmaster of Om to earn a limited time achievement. If you like Battle of Kyhlo and making your opponents fall to their death, you are going to love the new Skyhammer map. It is a 3 point capture map with some extra twists. In the middle of the map is an Asura gate that lead you to a powerful super weapon called the Skyhammer. 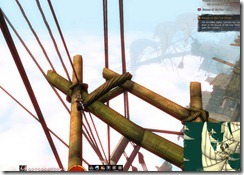 This massive cannon can be controlled by players to rain destruction down below. With a 6s recharge targetable AoE attack that deals for 10k damage and knockdown opponents, this weapon can quickly turn the tide. If the cannon isn’t enough excitement, Skyhammer also have glass flooring that shatter a few seconds after player contact. This make for some interesting strategic play as a well timed knockback or pull can send your opponents down the gaping hole and into their deaths. In addition, 2/3 of the objectives are located on the very edge of the map with glass floorings. This will bring another dimension to the old capture and defend. If you are low on achievement points, you are not entirely left out. There are a couple of really cool limited backpiece and helm skins you can get with this patch. 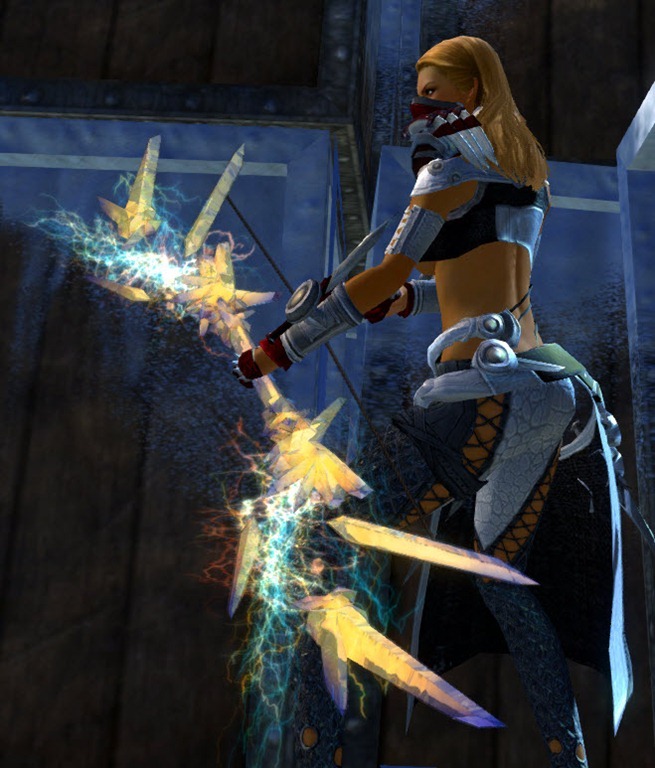 Fortune Scraps can be looted from Kite Fortunes you can find from kite baskets in open world zones or from the gemstore. If you have enough of these Fortune Scraps (250 for a helm, 150 for a backpiece), you can puchase some skins from the Fortune Scrap vendor. If you get lucky and get a Golden Fortune Scrap, you can immediately buy yourself a skin. All of the helm and backpiece skins are animated and they have really cool effects. Crafters are not left out of this patch either. Quartz is a new material you can mine in the new zone or gather from kite baskets, Sanctum Sprint chests, etc. If you have 25 of these Quartz crystals, you can go to a Place of Power (Skill points you commune with) and transform them into a Charged Quartz Crystal. 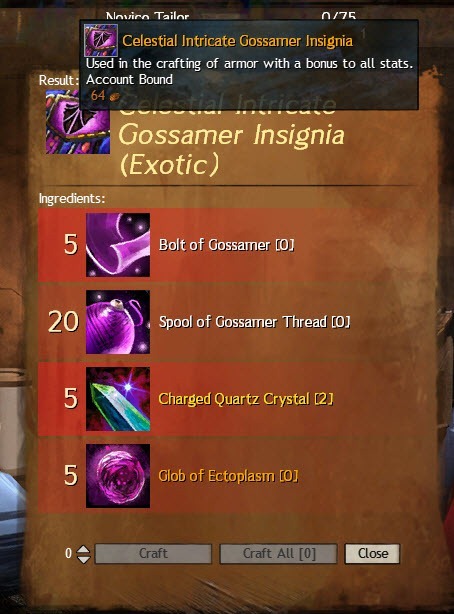 This Charged version is used to craft items with the new celestial recipe. Unfortunately it seems that you can only make one Charged Quartz Crystal per day per account. This would take you five days to craft a single Celestial Insignia/Inscription as each requires 5 Charged Quartz crystals. 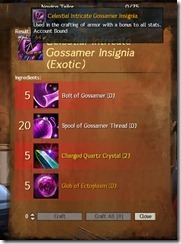 Celestial is a new recipe that can craft armor/weapons with a bonus to all stats. Previously this stat combo is only limited to Ascended gear. 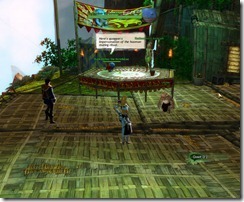 The new recipe can be obtained from kite baskets or more reliably from Zephyr Sanctum Supply Boxes. 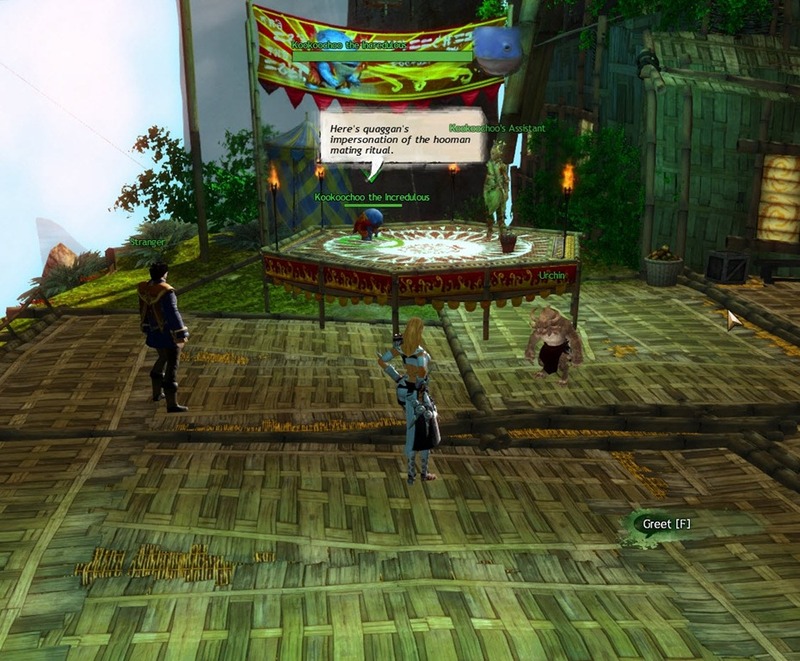 These boxes can be purchased from traders in the new zone in exchange for raw crafting materials and event consumables such as Zhaitaffy or Candy Corns. Each supply box have a 100% chance to yield a Celestial recipe and give you some other items such as Quartz. 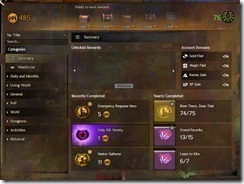 The achievement UI received a major overhaul to make it easier to use and more flashy. There is now a summary page where you can see you most recent completed achievements as well as any achievements that are near completion. In addition, there is now a Watch List page where you can quickly select achievements to be tracked on that page. 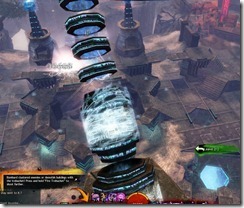 Bazaar of the Four Winds brought in its own set of achievements. Some of them are related to the scavenger hunt/exploration/Sanctum Sprint mentioned above. 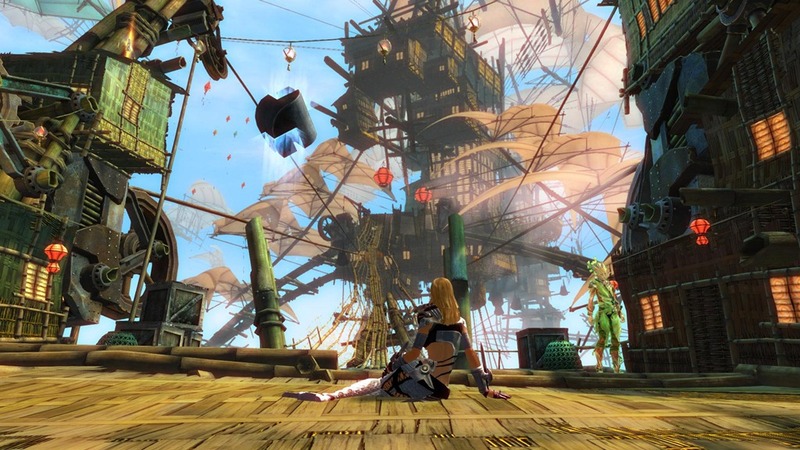 There are also achievements that require you to hunt down kites in existing jumping puzzles, dungeons and fractals not unlike the caches for Sky Pirates. Do you know where the entrance to the Bazaar of the Four Winds is ? Do you know how many mats are required specifically to buy the boxes? and what would you say about buying zhaitaffy since you can buy boxes with it? 1. Quartz Crystals are tradable? 2. Supply Boxes drop only recipes and Quartz Crystals? 1) yes tradeable 2) That I have seen yes, they could drop other stuff. I only opened 3. 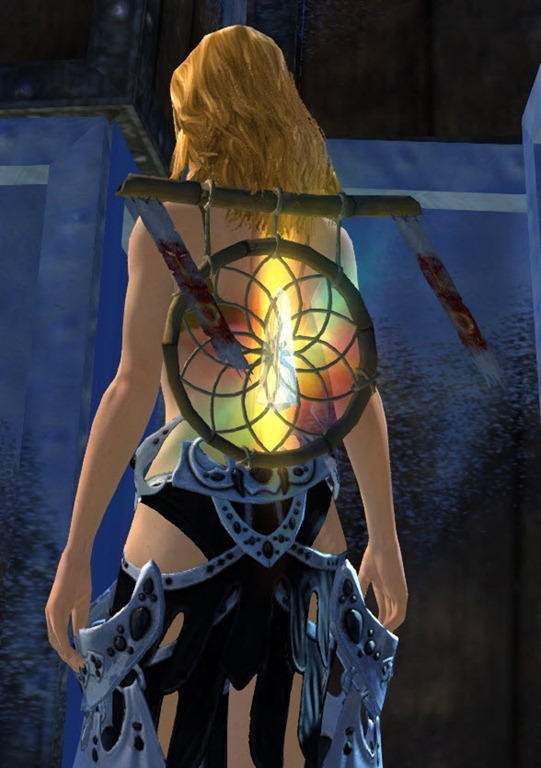 Does the catcher backpacks give aura even if they are hidden? So weapon and armor skins are automatically unlocked at certain milestones? So we don’t actually “spend” achievement points? Also, any info on what the milestone numbers are to unlock them? Correct. Milestones are basically every 500 achievement points. You’re good at that mini game huh? 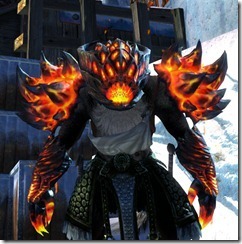 Gj as usual, I don’t know where gw2 community would be without your work. So will we receive achievement chests for our current points, or its only tomorrow every milestone? Yes you will get it for current achievement points but retroactive rewards are given once per day so don’t expect to get all the achievement chest the first day. So just to clarify, having more than 2,500 points guarantees you get every one of the chests in about 4 days, right? 2 weeks, could be 4 weeks but best to not count on it. Does the permanent karma gain boosts from the achievement rewards work for jugs and other consumables? 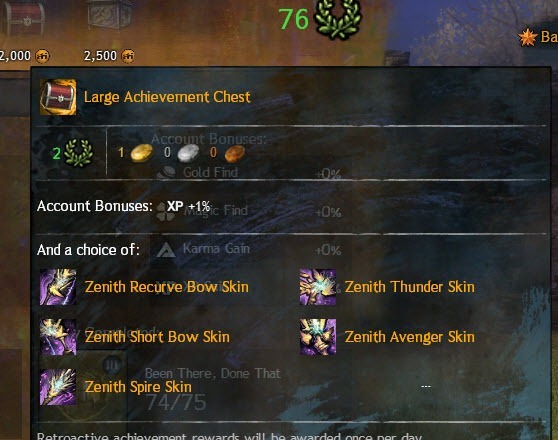 Could somebody explain me something considering the reward chests for achievement points? In the preview, you can see that some chests have a couple of skins. Do I have to pick one skin (e.g. Longbow) or does this chest unlocks all weapon skins in the preview? When you open a chest there are some rewards like Gold, boost, gems etc. And of course in big chests there are skins, for each chest you choose one skin, for example greatsword, after this you can withdraw as many greatsword skins as you want from achievement panel. Just a quick question I couldn’t really find answered. 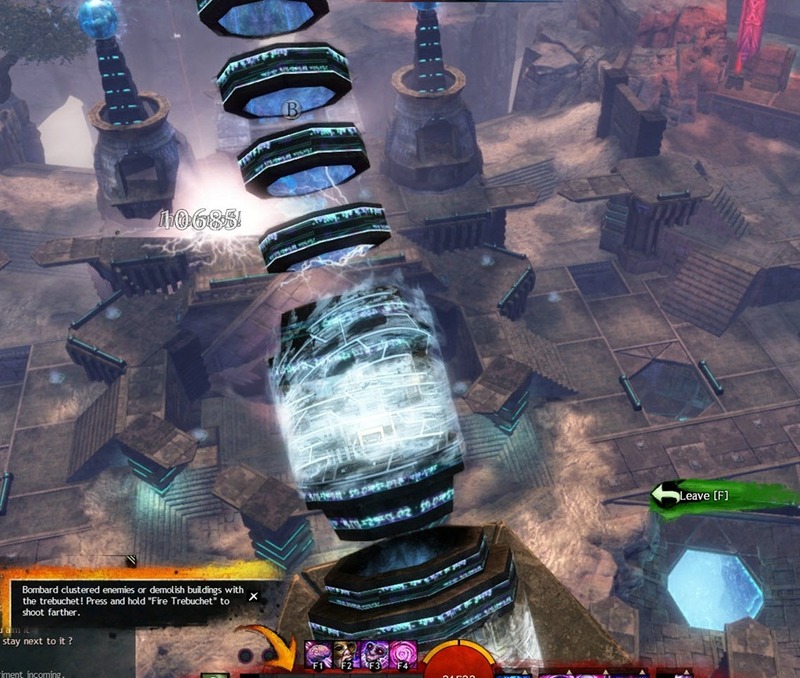 Is the new zone restricted to only level 80 characters, or does it scale you up? I’d love to see it on the new characters I’m leveling. I’m not sure about something tho, we’ll get those chests only until 2.500 APs? I mean those who got to 6k, 8k, 10k… won’t recieve anything else? Thought there maybe would be tiers from 500 to 10k or something like that. Oh thank you very much, I just read that we might get some armor and other pieces at 3000+, and guessed that there were other chests. Well I guess it will just stop at 2500 or so lol. so they will give me a cheev chest for each one that ive already done? I got only 1 cheev chest but have 1890 cheev points… just got update today and tha new area and wanted to know if im to still get another 2 chests since I already have almost 2k points and if so will I only get one each day till I get them all? Anyone got directions to that diving point? So the chest I have got after patch was “day/achievement 0” chest? From what I saw the first armor skin starts at 3,000 Achievement Points. Gloves. Either shoulders or head @ 4k and visa versa @ 5k. If you’re just under the next milestone, say 3000 milestone, then it comes the day for the 3000 milestone chest to be handed out and you still don’t have enough AP’s, and then the next day, you get to 3000, will you still receive the 3000 milestone chest? any idea on if the ppl trading materials for boxes will be permant? how long do i have to trade materials in for the recipes? any idea if the living world task are still do-able? or they have been removed? are those ap chests permenant or temprory? ?